It's been a while since I've actually spent anytime on How I Met Your Mother and The Big Bang Theory. Part of the reason is because they've on and off the air so sporadically the last couple of weeks, but also because both shows have been in a creative slump this season. Last night's episodes gave me hope that these shows can still be good. How I Met Your Mother: "Twin Beds"
The more Ted and Barney storylines we get, the better because when you team Radnor and Harris together and let them go at it, the funny ensues. When I think back at some of the funnier moments of this season, usually Ted and Barney are at the core, and this week was no different. 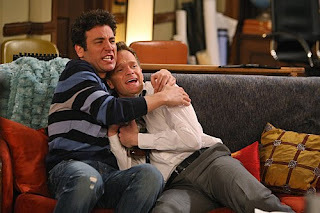 For me, the majority of the laughs came when Ted and Barney were getting drunk and fighting over which one gets to have Robin back. Even the letters they wrote to Future Ted and Future Barney were pretty entertaining. To be honest, the show should just be about the two of them. I did like how the show gave the Ted/Robin and Barney/Barney relationships some closure, but I'm sure Carter and Bays will go down one of those paths sooner or later (hopefully the former if you ask me). Maybe they can all move on and re-establish themselves and thus being a part of more interesting storylines until the inevitable re-coupling. Once again, the Lily and Marshall storyline could have been cut out, and things would have been fine. I hate how Marshall continues to be dragged down by the ball and chain that is Lily. Unfortunately, I cannot think of anything that will make me start caring about either them again, which is a shame because Marshall used to be my favorite character. Season 5 has still been mostly a bust, but I'm really hoping HIMYM is able to turn things around, and that "Twin Beds" was the spark. The Big Bang Theory: "The Spaghetti Catalyst"
This season of The Big Bang Theory hasn't been as bad as HIMYM, but it hasn't been on par with the brilliance of the first two seasons. There have been some pretty funny moments, mostly revolving around Sheldon and/or Penny, which is probably why this week's episode worked for me. Now, I'll never be on the Sheldon/Penny shipper bandwagon because that would just be weird and creepy, but I am a fan of the two becoming close friends, and "Spaghetti Catalyst" gave us a glimpse of what that friendship would look like. I was impressed at how much effort Sheldon put into his two dinner ruse because his actions really don't match up with his personality. 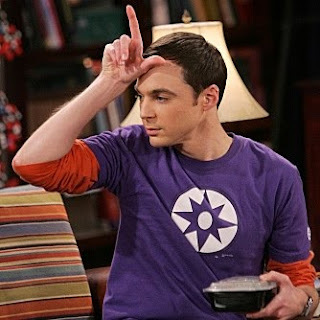 Old Sheldon really wouldn't understand why he would need to hide his actions from Leonard and Penny, and would probably just comment on how illogical they were acting. Instead he actually went out of his way to spend time with both of them. That's character development people! The broken family/sharing the child storyline wasn't anything groundbreaking, but it really stood out as one of the funnier elements this week because it encapsulated the relationship between the three characters. Having Penny and Leonard apart is already more entertaining than when they were a couple. Raj and Howard really didn't add too much aside from causing some uncomfortableness for Sheldon and Leonard, and I miss seeing them hang out. Other than that, it was a pretty solid effort from The Big Bang Theory.